Earn Your Degree In The USA & Save £s! ENROLLMENT FOR SEPTEMBER 2019 OPEN! 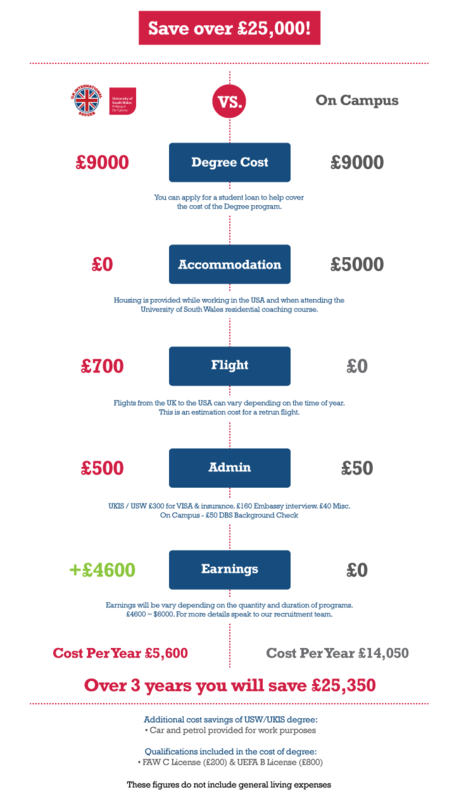 Our BSc (Hons) degree is an unbelievable opportunity for undergraduates to complete work placements, achieve UEFA certification and save £s. UK International Soccer have teamed up with the University of South Wales to create a unique degree opportunity. The degree will teach aspects of working with children and youth coaching, football coaching, football development, social inclusion, and sports management skills. The course is based in the USA with lectures, seminars and tutorials delivered on site and via on-line material. Gain insight into an industry leading company through a unique innovative learning experience in the UK & USA. UK International Soccer will provide you with accommodation and transportation while studying in the USA. Acquire valuable experience, while earning $ coaching football. Obtain your FAW C License & your UEFA B License. Every year we recruit hundreds of coaches from around the world to work in the United States. We are currently enrolling students onto our BSc (Hons) Football Coaching, Development & Administration course. Work placements in the USA begin 2020, with the academia & university components beginning September 2019. Complete the form and one of our recruitment team will contact you. Do you hold a football coaching qualification? "This is a unique BSc degree that allows candidates to get hands on experience within the field of football coaching!" The BSc (Hons) Football Coaching Development and Administration course is aimed at students who want to work in a vibrant and dynamic environment. This course provides an opportunity to gain industry-recognized coaching awards (UEFA) while studying all aspects of football coaching, football development, social inclusion and sports management skills. There will be further opportunities to apply your knowledge with an extensive work based learning programme provided by UKIS, working within specific roles and real life football projects. 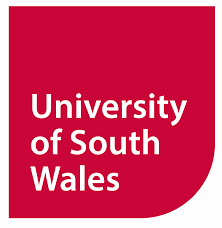 As part of the course students will be required to attend residential teaching weeks at the University of South Wales. The stated figures above may change without notification. Please contact UK International Soccer for any updated costs - Terms & Conditions Apply. 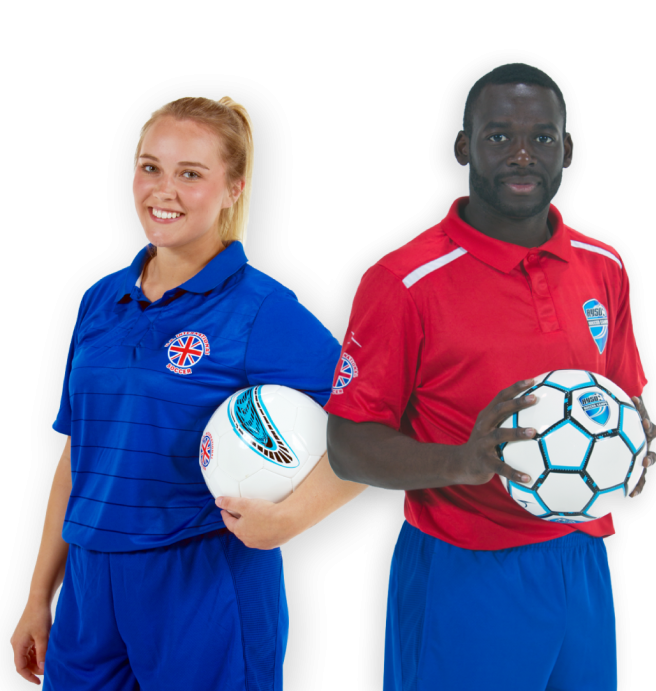 Level 1 in Football Coaching or equivalent foundation level football coaching qualification from a football national governing body (NGB). Our recruitment team will help you through the application process. Attend an evaluation event, and submit qualifications. UK International Soccer's HR team will provide support. Our expert staff will guide you through the process. Jump on a plane and begin the experience of a lifetime! "The opportunity to travel, work and continue with my studies is a huge benefit of this degree."